Emergency dentists are as essential in a city as any other type of emergency facility. Emergency dentists are open 24/7, giving one the chance to visit the dentist either in the middle of the night for a chipped tooth or to visit the dentist during the weekends, when normal dental clinics are closed. Being patient until the morning or waiting for the dentist until after the weekend is over may not always be the wisest solution, as dental problems may signal to some other major underlying issue. Also, for those who happen to work during the weekdays and cannot afford to visit a dentist during those times, emergency dentists also offer them a great opportunity to visit during the weekends, for a routine dental checkup. For those living in the second largest city in the state of Iowa, they know the value of emergency dentists, being a city of around 255,000 people. It is only obvious that emergency dentists would be highly prized in a city as populated as such, since there has to be someone to look after the emergency dental issues of the population. It is best to know some of the names and numbers of the emergency dentists nearby, as you never know when you might need them. That is why we have made a list of a few places where you could go to if you have an emergency. You can get emergency dental help in Iowa fast. 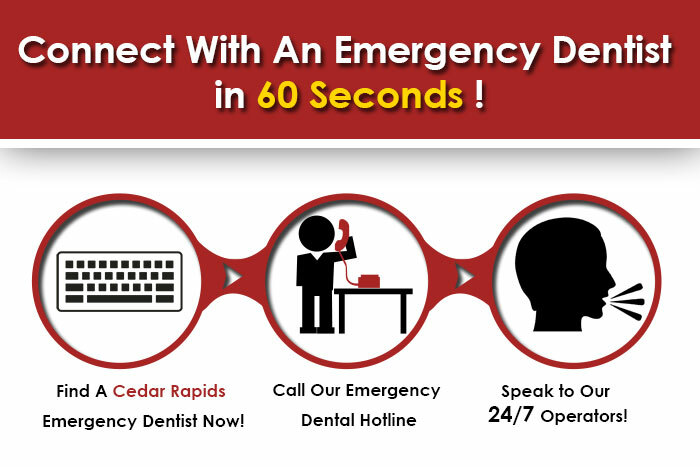 Description When traveling through the Cedar Rapids, there are many ways in which a dental emergency could quickly present itself. If you’re having a dental emergency it’s important to get help fast. Call our hotline and we’ll help you find a dentist near you fast! A family dentistry located at 1630 32nd St., it offers specialist care,such as Pediatric Dentistry, Cosmetic Dentistry, and Oral Surgery for Tooth Veneers, Tooth Whitening, Tooth Extraction, Dental Implants, and Sedation Dentistry, etc. Spring Valley Dental Care has been the community dental practice of Cedar Rapids for over 20 years, offering a state-of-the-art care in a personal and comfortable environment. Dr. John McGrane and his friendly team have years of experience treating a wide variety of dental needs, such as restorative care, cosmetic treatments or straightening teeth with invisalign. They provide services, such as Bonding, Cosmetic Contouring, Crowns and Bridges, Implants, Grafts, Root Canal Therapy, Extractions, Dentures, Veneers, Whitening, etc.